On October 13th there was the meeting of the English-speaking club. The topic of discussion was an Octoberfest. Two Peace Corps volunteers, Amanda Norton and Sharece Bunn, led the discussion. The event started with reading the information about when is Oktoberfest, beer and food, history, opening ceremony and other countries, were the fest is celebrated. There was mentioned that in Cincinnati, Ohio, United States there are 500,000 participants plus visitors and in Denver, Colorado, United States there are 450,000+ visitors. After reading the game was played, based on the questions to the text. The participants were divided into four teams with two and three players in each. One of the participants took part in the Octoberfest in Germany. His name is Vitaliy Chemenko, who is the citizen of Vancouver, Canada and he also has Ukrainian roots. That is why the participants of the club had an opportunity to communicate with one more English-speaking person. 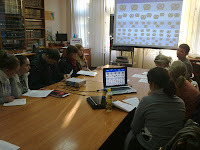 14 participants were present, among them 8 students, 2 specialists, 2 PC volunteers, 1 librarian and 1 guest from Canada. They all were practicing in using an iPad and decided to meet in a week and talk about Steve Jobs, co-founder and CEO of Apple Inc.